Despite all of that, leave to our friends at the excellent Tech in Asia blog to have the most sensible take, “Zuckerberg is in China…Who cares?” Indeed. Obviously, we don’t know a thing about Facebook’s designs on China. But to make sense of the speculation it’s helpful to consider the actual scenarios by which Facebook or Twitter or indeed any foreign social network might enter China, and to look at how different stakeholder groups will react to the possible scenarios. This is different than analyzing business strategy or financial implications, but ultimately it’s all connected. At the risk of oversimplifying, there are four major scenarios that we can envision: extending the mothership service to China; developing a separate “splinter” service for China under the original brand (this could be disconnected from the main service, or just enforce dramatically different policies); buying an existing Chinese social network; and doing nothing. Obviously, they’re not all immediately practical. Facebook is blocked in China, which makes extending the mothership difficult. There are also intermediate possibilities that blend aspects of these scenarios, but that’s a deep rabbit hole to go down. 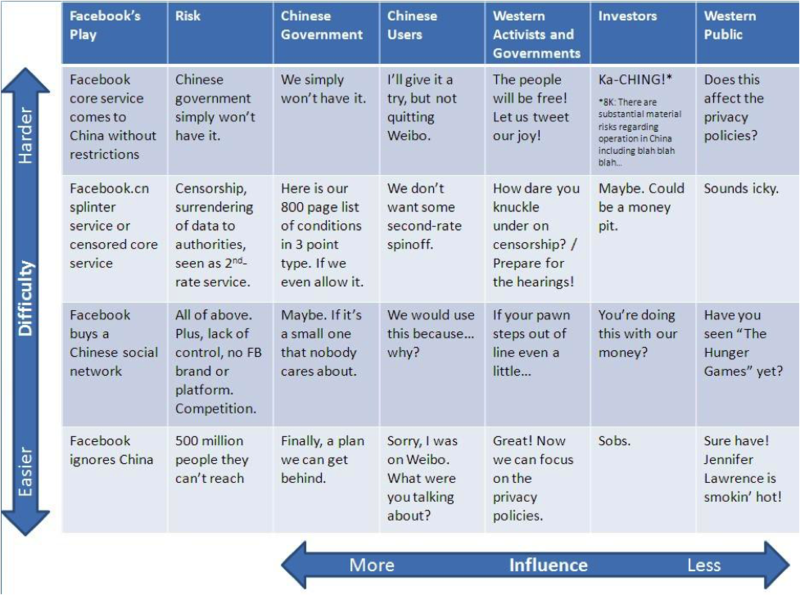 Along with these scenarios there are five major stakeholder groups, not including Facebook themselves: the Chinese government; Chinese Internet users (potential customers); Western activists and governments; investors; and the Western public (aka Facebook’s current users). Admittedly this format throws a lot of nuance overboard, but nevertheless there’s a clear three-way conflict that emerges. The approaches that are more acceptable to the Chinese authorities are both riskier with regards to Western activists and regulators and, importantly, less relevant to Chinese users. The approaches that are most relevant to Chinese users and have the highest potential return to the business are unacceptable to the Chinese government. Ultimately the Chinese government calls the shots. The basic math is that to even have a chance of operating here Facebook would have to apply the mandated censorship policies either just to users of its core service in China or to a spinoff service that is kept separate from the core service. It would also have to be prepared to surrender Chinese user information to the authorities if requested. That will raise eyebrows as Facebook knows a ton about its users by design. The risks of these approaches are clear to anyone who has studied the history of Yahoo in China and followed the congressional grilling of US Internet firms operating in China back in 2006. That was the stone age of social networking (Rupert Murdoch bought MySpace, Facebook turned 2, Twitter was hatched), and the political atmosphere around such things has not become any less sensitive since then. If anything, the messianic aura that clings to social networks and of which Chinese authorities have always been so distrustful has been exacerbated by last year’s political events in the Middle East. And let’s not forget recent events here in China and the leadership transition later this year. There are ways to create distance between the core Facebook brand and service and the Chinese government’s likely requirements, but those ways don’t eliminate political risk at home, and they all make the service less appealing to Chinese users. These same users are already being wooed away from traditional social networks by microblogs and have a colorful history of rejecting foreign online services as irrelevant even when they’ve been allowed to operate here without restriction. Remember MySpace China? Me neither, and a friend of mine helped launch it. Owning a local social network would provide a layer of insulation from the risk of Western backlash, but at the expense of sacrificing much of the point of entering China. None of this predicts whether Facebook will enter China, or how they might attempt such a thing. They’re probably playing a very long game. Whatever path they choose, it won’t be easy, either in China or at home. Bear that in mind next time Zuck is spotted in China and the tongues start wagging. *Note to editors: Can we get over the fact that Zuck’s girlfriend is Chinese American? Everyone is compelled to point this out, but net impact on the Facebook-in-China story is zero-point-zero. This entry was posted in Uncategorized and tagged Censorship, China, Facebook, Internet, Politics, Rectified.name, Technology. Bookmark the permalink.